Drain the cucumber in a colander for a few minutes, then dry it on some paper towels. Drain and dry the onions the same way. Toss everything in a big bowl and mix until well combined. Cover with plastic and stick in the fridge until ready to serve. 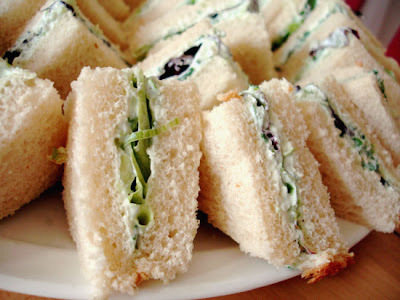 You can serve on bread as tea sandwiches or make into a ball and serve with crackers as a dip. You can also add a bit of Tabasco for a kick and add bacon crumbles to the sandwiches.